Sterling silver Amethyst ring inlaid with sugilite. Lab created opal ring in sterling silver by Mark Hileman. This dazzling ring is inlaid with 7 pieces of laboratory grown opal in a sterling silver band. The ring is 5.5mm wide and is shown in a size 6 for scale. It will be made to order in your ring size in 4 to 6 weeks. Sizes larger than size 8 will be an additional charge. Select your ring size from the drop down size menu. This ring is available in a variety of opal colors and combinations. The last photo shows the blue-green lab opal option. As you can see it is just as beautiful as top Australian opal. Laboratory created opal has essentially the same optical, physical and chemical properties as natural opal. The primary difference is natural opal contains water and laboratory grown opal has no water content. The water is replaced with resin which actually makes the synthetic opal stronger and less prone to cracking and breakage than natural opal. Lab created opal is a great option to get the fire and colors of top Australian opal at an affordable price. Most of our ring styles are also available in 14k white or yellow gold as well as stainless steel for an additional charge. 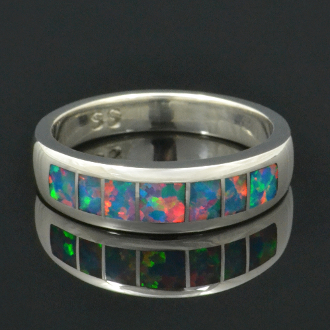 Visit our Flickr page to see examples of some of the great lab created opal rings we have made.